Our events will be held at the Dutch Burgher Union (DBU). 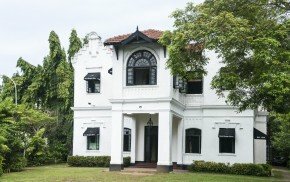 We have picked the DBU as our venue because of its beautiful old world charm and for its central location, making it a convenient spot for ladies to attend our meetings. The club being one of Colombo’s earliest clubs with its centuries old history is known for its cosiness and its delicious food and drink. The ticket price includes the location, food, tea/ coffee, and speaker. We can’t think of a prettier building to host a ladies club. Take in the colonial beauty while listening to the inspirational speaker and making new friendships at the ladies club. This August we are talking about make-up and more. A fun workshop for ladies. Trying out do it yourself make up tips. Expressing who we are through make up / make-over’s matching it to our own personality. Keeping a healthy skin. Not to mention meeting new friends and making new connections. To book your place click below. A mingling mixer this September for the first time in Colombo. It’s a rare event where we get to discover the best in us, engage in inspiring storytelling and connect with one another, nibble & try out delicious eats. Including a session conducted by Mei Flynn one of our own ladies. Looking forward to this entertaining night with you ladies as always!